Sam gets a new sleek coat when he and Dean travel to Chicago. There are two different version of this jacket, one lighter one (grey) and one darker one (black). They're hard to tell apart in certain lighting configurations, so I've listed them in the same category. I'll differentiate them where I can. The darker version appears kind of greeny-black indoors, but outdoors looks more blue. It’s got minimal style elements, except for a seamless pocket on the right breast. It does up with large dark buttons and has large lower flap pockets. In Stairway to Heaven (9x22), Sam wears this coat when he and Cas travel to find Josiah. He wears it until the end of the episode. In Do You Believe in Miracles (9x23), Sam wears this coat for the entire episode, only taking it off before he put Dean in his room and grieves. In Just My Imagination (11x08), Sam wears this jacket when they go to investigate Sparkle’s death with Sully. He takes it off briefly in order to wear a disguise to enter the house and view Sparkle’s body, but other than that, he wears it for the rest of the episode. In Into the Mystic (11x11), Sam wears this coat to salt and burn a corpse, and then again when he and Dean guard Mildred and wait for the banshee to strike. 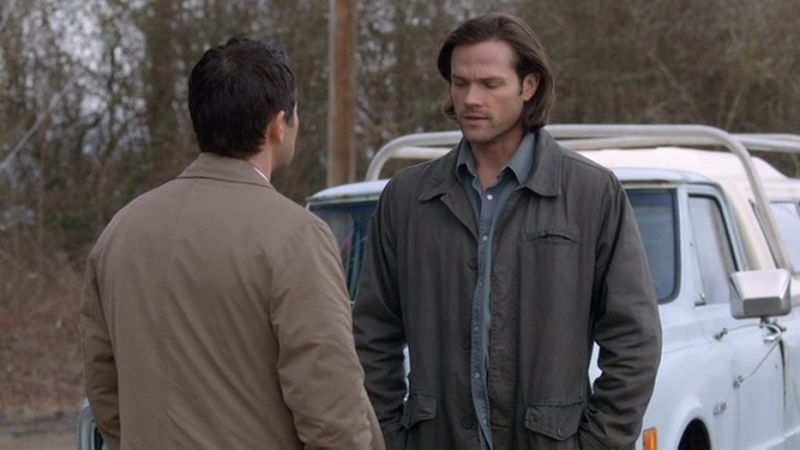 In The Chitters (11x19), Sam wears this coat when he meets up with Dean at the bar and is introduced to Cesar and Jesse. He keeps it on for the rest of the episode. 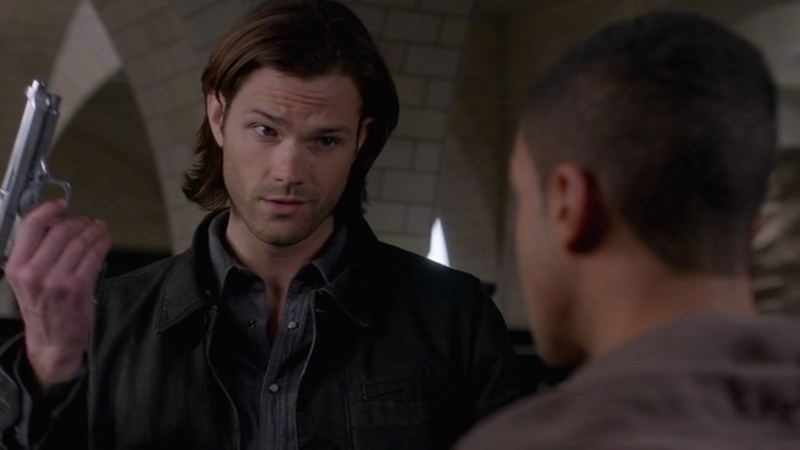 In The Foundry (12x03), Sam wears this coat whenever he is not either in the Bunker or a motel room. In Rock Never Dies (12x07), Sam wears this coat on the drive to LA and when they meet up with Castiel and Crowley. He then changes into a “rock musician” disguise. In Family Feud (12x13), Sam wears this coat in the car on the way to the case, before changing into a suit for a while. He then wears it again when they pick up Gavin from the bus depot. He keeps it on until they go back to the Bunker to send Gavin back in time. I think there are two versions of this jacket. I'm not sure if this was a deliberate choice on your part, but some of the episodes listed here have Sam wearing a lighter shade of the same jacket. I know that it's the same type of jacket (the Quiksilver Ace Jacket) but in some episodes of season 10 it looks like he has one that's a shade lighter than the one he got in season 9. Like, 10x02, 10x11, 10x17, and 10x23 all have Sam wearing the grey version, while 10x06, 10x13, and 10x19 have him wearing the black version. I know they're basically identical, so I don't know if there'd be much of a point making a seperate entry for the other one; it was just something I noticed. Re: I think there are two versions of this jacket. Thanks so much! I DID notice the colour variation, but it's really hard for me to tell what's a different colour because it's a different colour, and what's a different colour because of lighting choices made by the show.